South Africa coach Rassie Erasmus admits he is not sure how long he will be allowed to stay in the job despite receiving backing from the nation's rugby chief. Erasmus had voiced fears that his future was on the line in Saturday's Rugby Championship clash with New Zealand, before South African Rugby Union president Mark Alexander offered some reassurance. "The making of Rassie Erasmus as the Springbok coach won't be in a victory or defeat on Saturday," Alexander said, dismissing consecutive defeats by Argentina and Australia as "hiccups". But Erasmus, who was hired in March and is tasked with transforming the racial balance in the team, did not appear convinced about his job security. "I don't know if it's a good thing when they start saying those things, or is it a bad thing," he said of Alexander's endorsement. "The big thing we are trying to fix here is we are trying to fix South African rugby long term." Erasmus is under pressure to reverse South Africa's fortunes, after the 1995 and 2007 world champions slumped to seventh in the rankings. "The only thing everyone's been talking about the last few days is about 'Are you going to get fired?'" he said. "For me, the point around that is more if the process stays on track and South African rugby gets fixed that's the most important thing. "If, as a cost I have to go or some of the players have to go, then it is what it is." 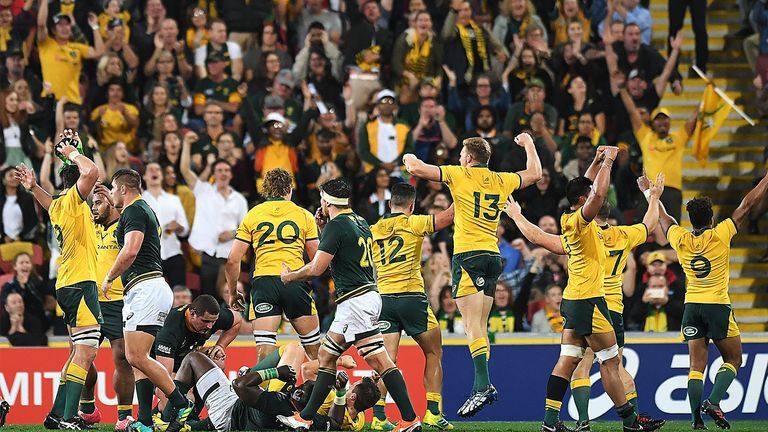 Defeat on Saturday would be South Africa's fourth in seven matches since the 45-year-old former Test loose forward took over. He also received support from All Blacks coach Steve Hansen, who compared it to the 2007 World Cup when New Zealand stuck with Graham Henry, Wayne Smith and himself despite the shock loss to France in the quarter-finals. "We learned a lot out of that," Hansen said. "It would appear (Erasmus) has a plan. He knows what he wants to do and when he wants to do it and how he wants to do it. Sometimes the plan is long term rather than short term. "When you hear them talking, they all seem to understand what the plan is. When it's like that, you've just got to be patient and see where it goes." He added: "I look back at 2007 and the NZ Rugby Union were patient enough to give Graham, Wayne and myself another opportunity." After 2007, the All Blacks went on to become the first side to win back-to-back World Cups.